Maybe conspiracy theorist Jim Garrow was right about the impending revelation of alien contact. A semi-official Iranian news agency reported Sunday that former National Security Agency contractor Edward Snowden had revealed documents proving that extraterrestrial beings had secretly controlled U.S. domestic and international policy since at least 1945. The FARS news agency reported that nearly 2 million “top-secret documents” revealed by Snowden to Russia’s Federal Security Services (FSB) “confirmed” that an alien race known as “tall whites” was behind American efforts to create a global electronic surveillance system to hide their presence and eventually control the planet. The “tall whites” had also assisted in the rise of Nazi Germany in the 1930s by helping them build more than 1,100 technologically advanced submarines in just four years, the Iranian news agency reported. 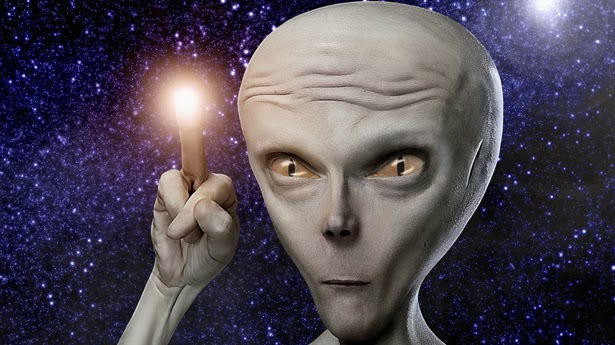 Canada’s former defense minister, Paul Hellyer, recently told Russia Today that at least 80 alien species had visited Earth — including the “tall whites,” which he claimed worked with the U.S. Air Force in Nevada. Hellyer had been allowed to examine Snowden’s documents and proclaimed them “accurate,” according to the FARS report. FARS claimed that a “cataclysmic power struggle” was under way in the U.S. government to purge its “secret regime” of extraterrestrials that was led by President Barack Obama himself. The tea party activist Garrow, who also suggested the president would order nuclear attacks on U.S. cities, recently claimed that Obama would implement a secret plan decades in the making to distract from his sinking poll numbers by announcing that scientists had communicated with aliens. Alas, like many such reports, their sourcing appears to be fairly circular and weakly founded. Snowden himself said he didn’t bring any of his secret documents with him to Russia, where he’s now living, and the journalist he’s worked with on his revelations appeared to mock the FARS report. The FARS report itself was basically cut-and-pasted from the fringe conspiracy website What Does It Mean, and the semi-official Iranian news agency doesn’t have the best track record. The site recently reported that a 27-year-old Iranian man had invented a time machine, and it was fooled by a satirical report in The Onion that most white rural voters would rather vote for former Iranian President Mahmoud Ahmadinejad than Barack Obama. So even if Obama actually is going to reveal alien contact to boost his poll numbers and allow Canadian troops to overrun the U.S., as Garrow has claimed, that chain of events hasn’t been kicked off just yet.